The electric dipole approximation is a concept widely used in atomic, molecular and optical science. 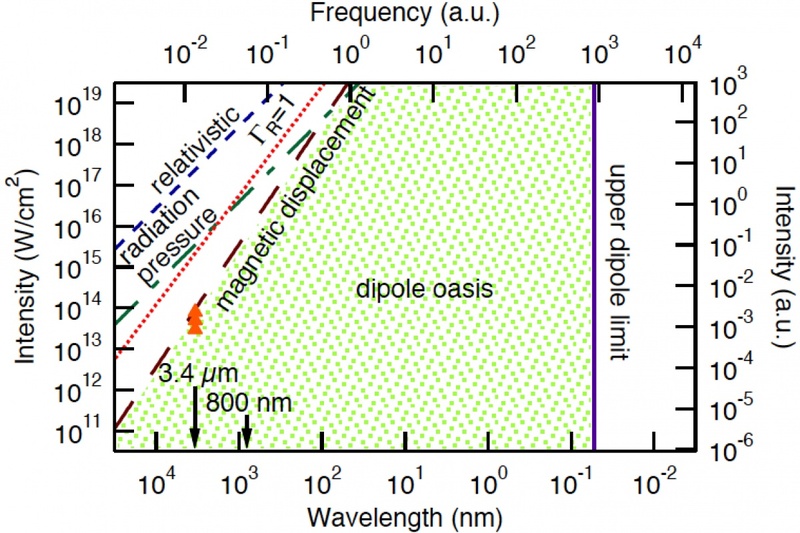 Here, Ursula Keller and co-workers report the experimental observation of the breakdown of the dipole approximation in its long-wavelength-limit, which is less well known than its short-wave counterpart. The results concern the important case of linearly polarized light and identify the relevant signature in photoelectron momentum distributions obtained with strong-field ionization of various atomic species. This breakdown is manifested in asymmetries of the photoelectron momentum distributions in beam propagation. The maximum of the photoelectron distribution is shifted opposite to the beam propagation direction, what appears counterintuitive in the frame of the radiation pressure picture brought forward in earlier work. The authors could pinpoint the combined action of the magnetic field and the Coulomb potential as the cause for their observations. To the best of their knowledge, the results represent the first observation of non-dipole effects in strong field ionization with mid-infrared pulses. 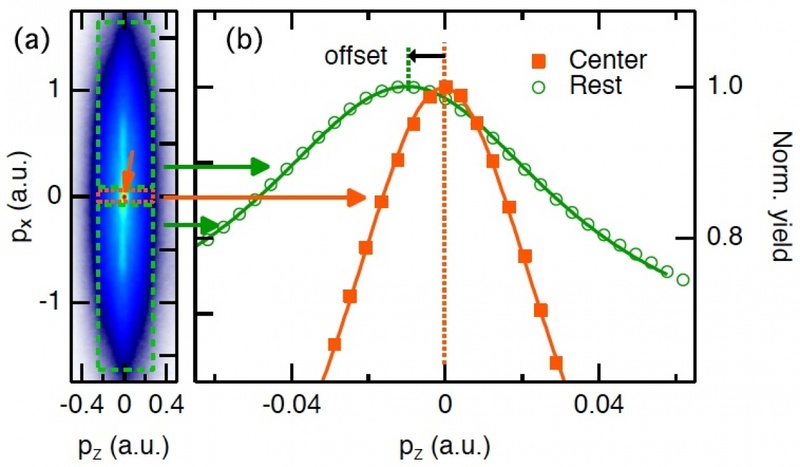 The results have implications for all strong field processes that are based on rescattering. This includes the generation of high harmonics, in particular in the hard x-ray regime, photoelectron holography and photoelectron diffraction, which are relevant for a wide audience in the general physics community, specifically for the growing field seeking to exploit the advantages of transferring these general methods to long-wavelength lasers. λ =1 a.u.. The long-wavelength limit arises due to the laser magnetic field component, and is characterized by the ratio Up/2c =1 a.u..
from field-ionization of highly-excited Rydberg states used as reference for pz=0 a.u., and the dashed boxes indicate the areas taken for the momentum-offset analysis. (b) Projections of the PMD onto the beam propagation direction together with Lorentzian fits. The orange curve (squares) is used to set the pz=0 a.u. reference and the offset of the maximum of the photoelectron distribution is extracted from the fit on the green markers (circles).